The Roland MKS-70 Super JX is a classic Eighties synthesizer that packs the power of two Roland JX-8Ps into a single 2U rack module. While the MKS-70's sound is still sought after today, most units on the second-hand market have old ROMs that don't support the ability to send SysEx commands to both of the device's internal synth modules. This presents a problem for artists wishing to perform automation on complex synth patches or editing those patches via MIDI. 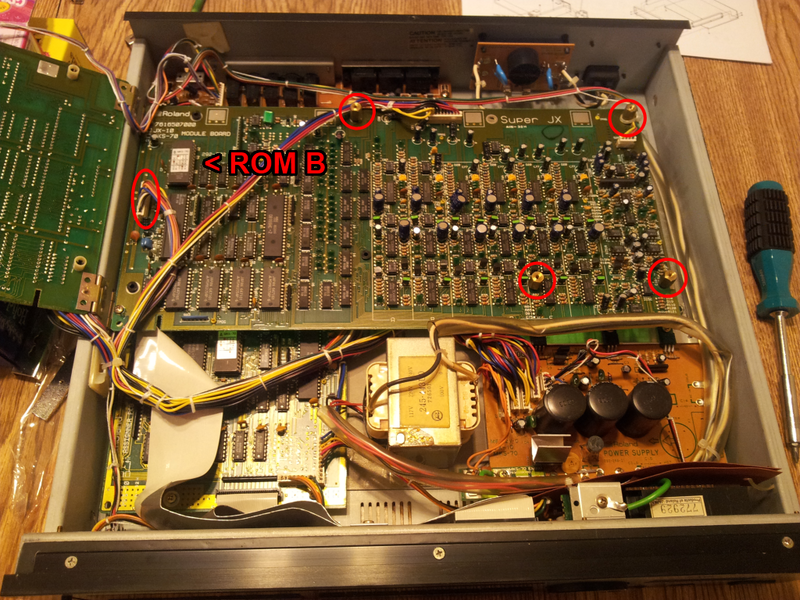 First off, the MKS-70 contains three EPROMs: The main ROM (A), which is on the synth's assigner board, and the two module ROMs (B and C), located on its module boards (one board for each synth part). You need to have version 1.08 of the main ROM and version 1.06 of the module ROMs to be fully up-to-date. While there is no way to see the module ROM version without cracking the synth open, you can see the version of the assigner board ROM by pressing and holding the VALUE button on the front of the unit while powering the device on. The ROM version will appear on the display for seven seconds. If you have main ROM version 1.03 or earlier, you will need to replace all three EPROMs in order to get full SysEx capabilities. You may wish to do some more research on this, but general consensus is that if you have 1.04 or later, you only need to replace the assigner board ROM. My MKS-70 had version 1.03 of both the assigner and module ROMs, so I had to replace all of them. As the time of this writing, there are several options available for obtaining the latest ROMs for your MKS-70. Up until some time in 2012, Roland USA upgraded the EPROMs for free if you sent yours in to them and covered shipping costs. When I called them in early 2013, however, they said that they will now only accept full MKS-70 units shipped to them, and they will perform the upgrade at a rate of $80 per hour (in 15-minute increments), plus shipping. It may be different at service centers outside of the United States. If you wish to go this route, make sure you have your serial number on hand and call them at 323-890-3740. Their USA service center is in Los Angeles. If you own an EPROM burner, you can upgrade your own EPROMs or burn new ones using ROM image files obtained from other users. Just search around on the most common synth forums and you're bound to find someone willing to share. KiwiTechnics (New Zealand). Use the Contact form to contact the owner. Vintage Planet (The Netherlands). ROMs listed separately or as a bundle. eBay (worldwide). I've seen the ROM sets up here for various prices. I was very nervous about doing this, but it turned out to not be very difficult. Here's a walkthrough of my successful upgrade from 1.03. 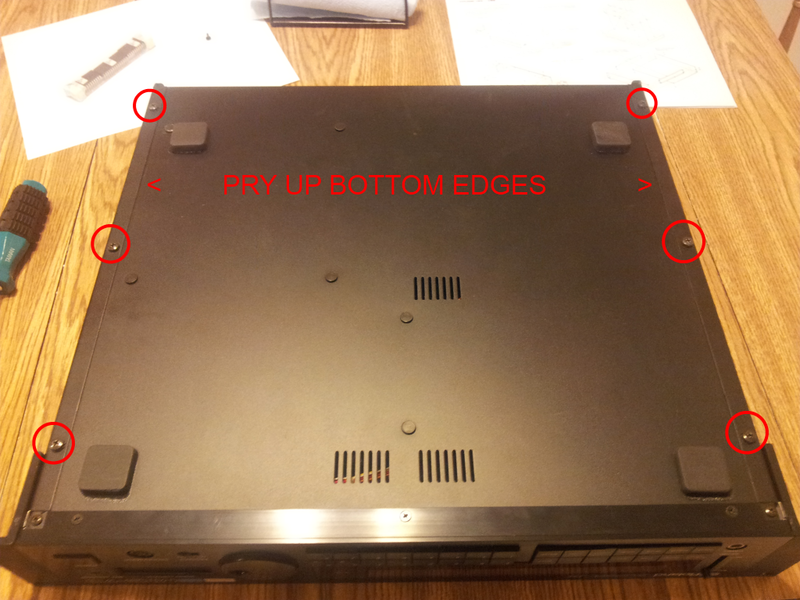 First off, with the synth disconnected and in a well-lit area, remove the single screw on the rear of the lid. I removed the rack ears, but after having the device apart, it looks like it was unnecessary to completely remove them- however the forward screw on each side appeared to fasten to the front of the unit, so at least remove that one. 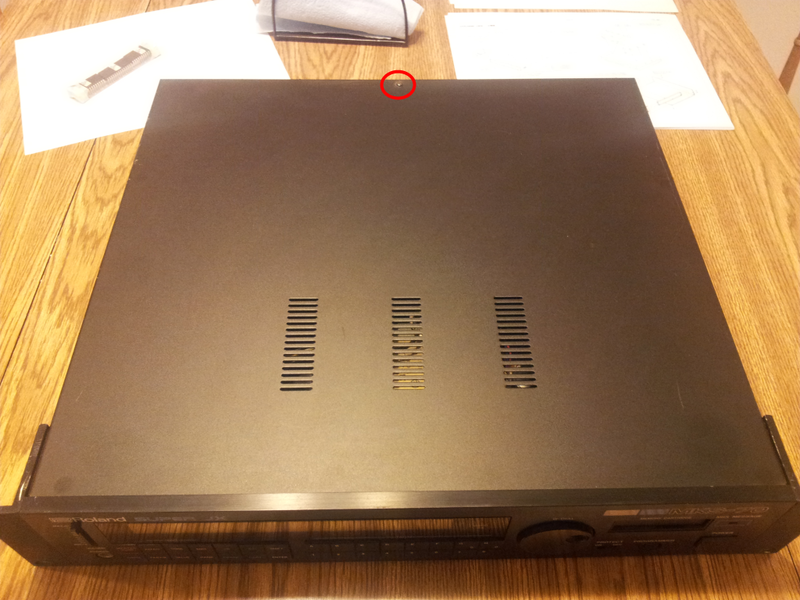 Next, remove the six circled screws on the bottom of the device. In my case, the lips on each side of the top cover appeared to be sealed to the bottom of the case. I used a small flat-head screwdriver to gently pop the seal and free the top cover. 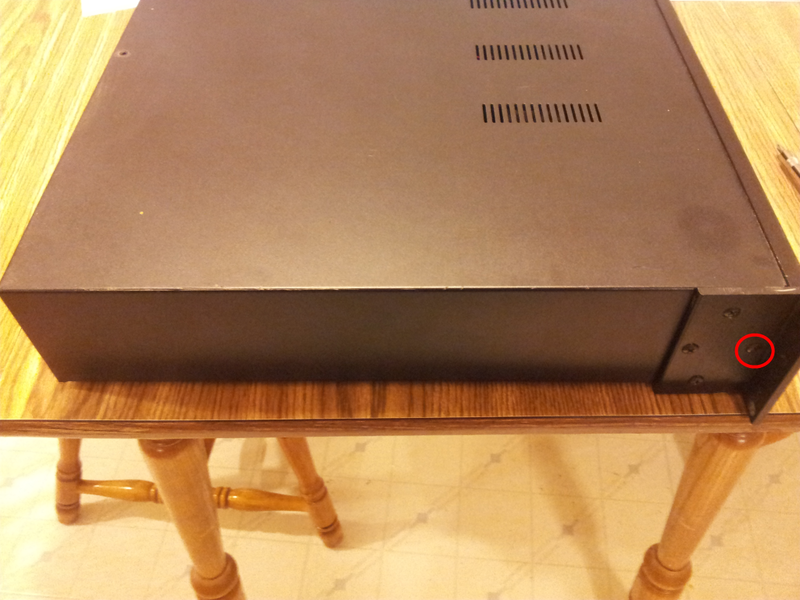 After turning the unit over, remove the top cover by sliding it toward the rear. The first thing you should see is the top module board, where ROM C resides. (Mine was clearly labeled, including version number.) Carefully replace the EPROM and then remove the four circled screws. Swivel the top module board out of the way (I supported it with a couple small boxes placed next to the synth) to reveal the second module board, containing ROM B. 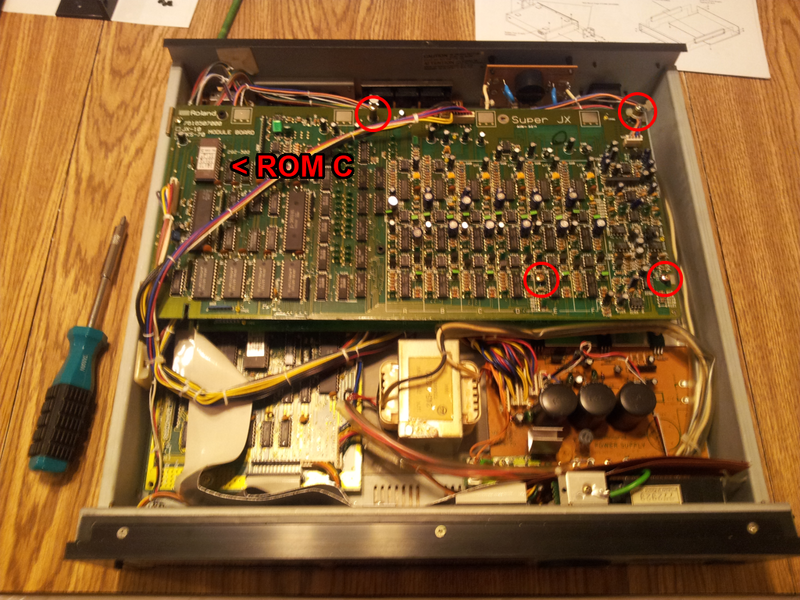 Replace the EPROM and then remove the circled posts. Mine were actually sealed to the board, and I had to use pliers to loosen them. I also disconnected the cable circled on the left to allow this board to swivel more freely. 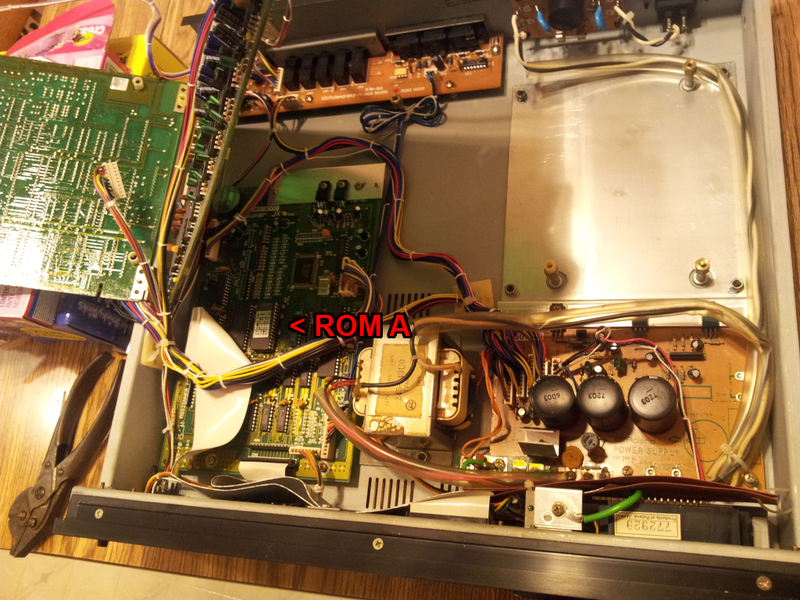 Swiveling up the second module board fully reveals the assigner board, home of ROM A. You might want to ask a friend to hold the module board out of the way, since at least in my case it didn't go up enough to stay in a fixed position- but I managed to replace the EPROM one-handed. After checking that all your EPROMs are firmly seated, reconnect any cables and replace any screws you removed, then replace and fasten the top cover. After re-connecting your MKS-70, try sending SysEx to both synth parts in a patch that uses both tones. If you're a Cubase user you can easily do this with the MKS-70 MIDI device panel available at Cykong. Before the upgrade, the second virtual PG-800 in the panel did nothing, but now it adjusts the second tone. Yes! Amazing! I'm going to do this upgrade to my MKS-70 soon and your excellent guide will be most useful. Can't wait to set some sequences running and get tweaking without laggy notes and with proper cc control. Thank you very much for taking the time to post this. @Unknown commenter - This is clearly false, as I was unable to use software to program both MKS-70 parts before the upgrade, and am now able to program both parts from software after the upgrade. This is very well-known, and is the most common reason for upgrading to these specific ROMs. Without the upgrade, only the first MKS-70 part responds to SysEx. The other part explicitly ignores it. Thanks a million for taking the time to post this. I've just replaced the three eeproms on my MKS-70 (thanks, Doug, at synthparts.com !) with reference to these photos. Your having done this saved me a great deal of frustration, and made it into a 15 minute job rather than an evening's exercise. I'm glad it was helpful! Enjoy your MKS! Also, I would replace the memory backup battery while you have the unit opened up. They are getting up in age! Also have a look a the power supply caps if you're brave enough! My 1.08 Eprom A has just arrived from vintageplanet.nl, by airmail in less than 48 hrs from ordering. Now that's service. Wish me luck... I'm going in! This walkthrough should make it a joy. Thanks! All went well. Excellent upgrade, superbly described here. Just done the upgrade, thanks very much for your step-by-step guide!